This version was designed specifically for my daughter. I can’t even taste test it because I have to avoid the primary ingredients until the new year! Note: Spelt Flour is NOT gluten-free. This recipe is Dairy-Free. Prepare muffin tins (lightly oil) or use Lékué silicone mould, which don’t need to be greased. Mash ripe bananas in a small bowl. In a separate medium bowl, whisk egg, then add mashed banana and remaining wet ingredients. Whisk together. Pour wet ingredients into dry ingredients and incorporate. Not too much. Don’t over mix. Fold in additions if using. Careful not to stir the mixture too much. 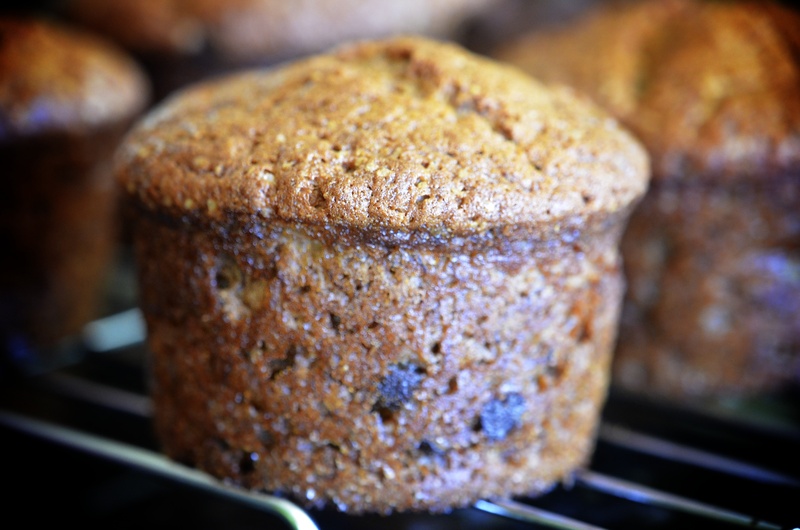 Fill muffin tins 3/4 full or to your liking. Bake for 25-30 minutes depending on your oven. Check for doneness using method of choice. Remove from oven and let stand for a few minutes before transferring to wire rack to cool. Yield: 6 muffins +1 (I have a mini loaf pan & mini bundt pan that I use when I have a little batter leftover).